The sketch I've been using the last couple of weeks gets flipped around today to accommodate 3 uncropped 4x6 photos. The photos were taken at my aunt's 90th birthday. She's the strongest woman I know enduring many, many surgeries to treat her degenerative joint disease. During this time, she was recuperating from another illness at our local assisted living facility. She's as sharp as ever. She is back home now with her husband of over 70 years. I visited her last week. Her only complaint is that she can't do all her 'work' like she wants to. The house isn't spotless and that displeases her. I hope that is my only complaint at her age. 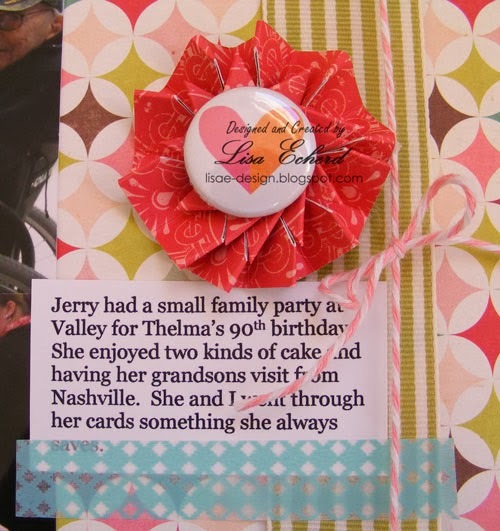 For the page, I used some accordion flowers as embellishments. I've linked the videos together so you can see the one on flowers as well. For the largest flower, I wasn't happy with the button initially glued on so I glued some Two Peas flair right over it. Their flair is very flat which was a big bonus in this case. 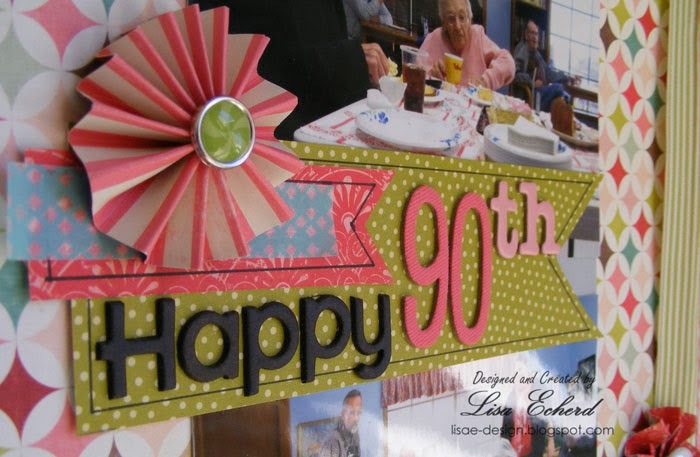 It's a cute and a bit more modern touch on a page with older styles and embellishments. A touch of Washi finishes things off. I have one more page for this sketch coming along. It will have 4 photos. I also have another process video coming and a blog hope on Saturday. And if you like having lots of sketches to make scrapbooking fast and easy, don't forget about my new sketchbook found here. So lots going on here. Hope you'll visit again! Love the design on this, Lisa with the banners and pretty rosettes. 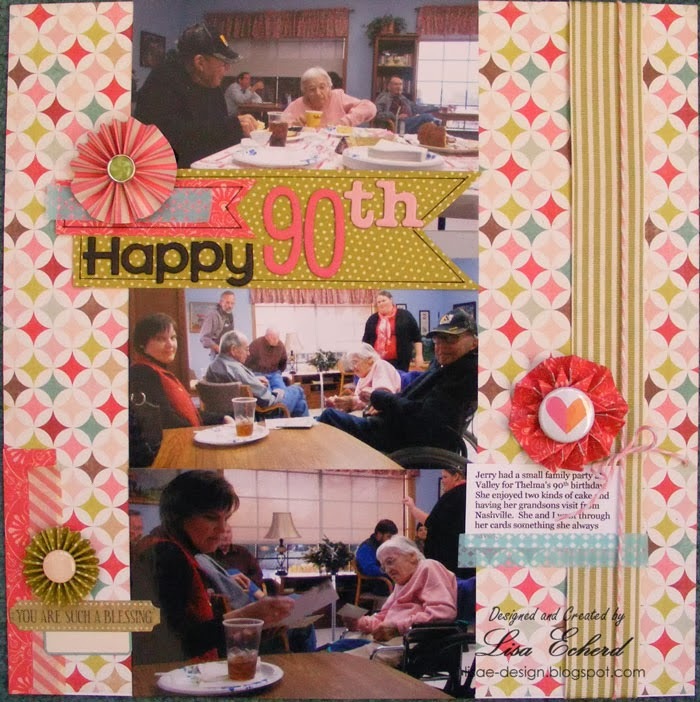 What pretty colors, papers and embellishments for your page. great page! love all the details! Beautiful page! Love the accordion flower embellishments! 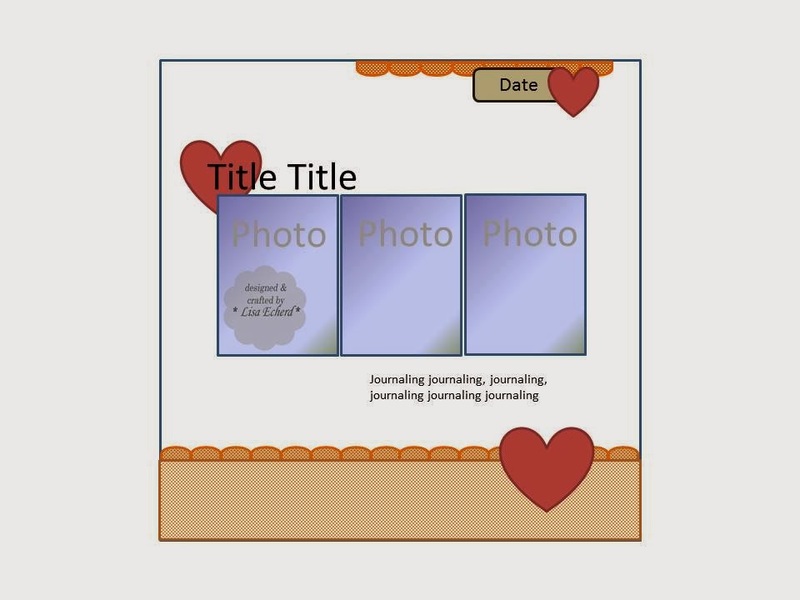 Lisa I love all your process videos and that you shared your resolutions made at the beginning of the year with us... your releases are so organized and inspiring, thank you! Happy Birthday to your Aunt, I hope that is my only complain as I age as well. Your layout is lovely as always. Great use of your sketch. I really like that flower with the flair on it.